A Georgian Counrtry House the Richmond Gate Hotel stands on the crest of the Richmond Hill, adjacent to 2800 acres of Royal Richmond Park and the famous Richmond Terrace with its views over the River Thames. The 68 stylishley furnished en suite bedrooms combine evey comfort of the present with the elegance of the past, modem points are available in all the rooms along with tea and coffee making facilities, minibars, in rooms safe and hair driers. Most bedrooms offer Air Conditioning. Wireless connectivity is avauilable in all areas. Award winnnig cuisine is presented in the Gates on the Park restaurant, which boasts two AA rosettes Guests can also enjoy English afternoon tea in either the club lounge or the lawned garden.The Hotel also has two elegant meeting rooms accommodating up to 50 people.Cedars health and leisure club offers an extensive range of leisure facilites on site, including a 20m indoor swimming pool, spa, gym, aerobics studio, fitness gallery and beauty suite. The Richmond Gate Hotel is set in a pleasant country setting adjacent to the Royal Richmond park only 7 miles from both London Heathrow and central London. Richmond offers main line train links to London Waterloo international and access to the London Underground network (Disctrict Line). 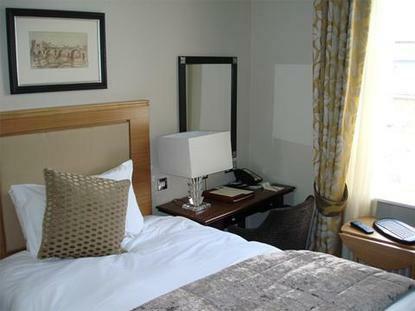 Kew gardens, Hampton Court Palace and Twickenham Rugby ground are within eeasy reach of the hotel as are the M3, M25 and M4 motorways, giving easy access to all major cities on the UK motorway network. Most bedrooms are air conditioned. There is free car parking on site for guests vehicles.